A sorceress is a female practicer of magic. You may ask yourself which witch is which as there are many name to call a sorceress; a witch, a soothsayer, a demoness, hag and more. 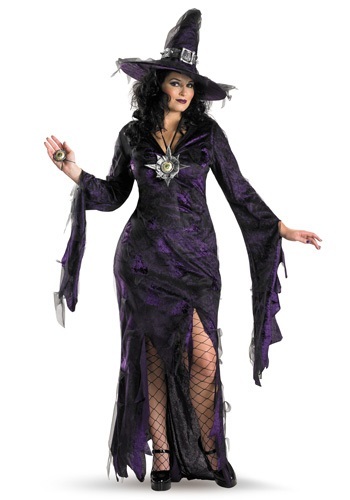 Whether you are your lurking in the woods to entice tasty children with your gingerbread house or are you sending out your flying monkeys to take care of your bidding, a sorceress costume will get you cackling. In sizes to fit toddlers through plus size adults, you will be wickedly attired for Halloween, a haunted house or even a theater production. 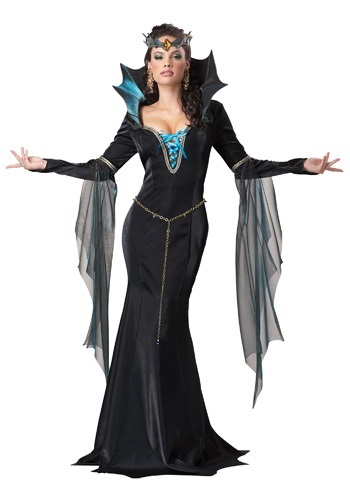 Typically a sorceress costume features a long tattered dress with back over robe or cape. Long full sleeves will add drama as you fail your arms about in incantation. The brimmed witch hat or sometimes even a wizard style cone hat is requisite headwear with a sorceress costume. Go for a hag look by adding a faux crooked and warted nose and disheveled long grey wig or keep it pretty with a long black fingernails and a feather boa.